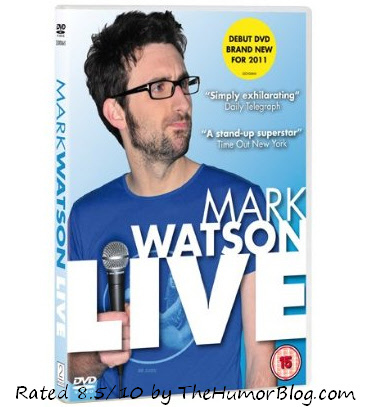 I was surprised to find out this is Mark Watson’s first DVD release, he seems to have been a good performer for years. Some things are worth waiting for though, so how does he do? Please note although I don’t tell his jokes in this article, there are some spoilers so please leave if you don’t want to know a thing about it! Ok now I’ve got the spoiler alert out the way…The gig begins in an excellent engaging way. Mark sitting quietly at a laptop on the stage, typing on a big screen things about people as they walk in. Loved this start and had those who go in early already laughing. Once everyone had made their way in he still doesn’t appear on the stage, but somewhere else, I won’t spoil it where, you’ll just have to watch and see! Once again more off the cuff comedy engaging the audience. Moments later and he finally makes his way to the stage to begin his stand-up routine. 1 minute in and it is a stark reminder this boy talks fast, and mumbles quite a bit. However I do like this, it is a different style to the clear cut Jimmy Carr’s and Sean Locke’s who never misplace a word. Mark’s stuttery delivery makes him even funnier! If you haven’t seen him before, his stand-up is one of story-telling. With no props, no stupid dances, no crazy voices. Some of his gags to drag on a smidgen but generally his timing is good, and the laughs flow nicely. During the DVD I did laugh out loud constantly. He is a very good stand-up comedian. Another thing I like about his style of comedy, is that it is often mocking himself and self deprecating. Rather then cracking jokes about minorities he goes the other way, and takes the piss out of his own personality and life! The performance was 70 minutes long, a reasonable length I felt. It could have perhaps done with being broken up in the middle though as it is just pure talking, and it can make it begin to feel like a slight drag towards the finish. Which, on that topic, wasn’t his strongest point. His finishing joke really needed to be funnier, it was good, but it wasn’t the grandest of finishes. There are quite a few extras including a tour diary. Randomly, their is also a clip of a man proposing to his girlfriend at the live show! Of all the extras the best one by far is a 20 minute video of Mark performing at the Bloomsbury Theatre a few years back, very funny and a nice addition to the DVD. Overall I really enjoyed the DVD. The performance by Mark was very funny, he is a top stand up comedian, it’s a good length feature, and a nice few extras to boot. Recommended. 8.5/10. It is available to buy now from Amazon and other retailers..